Lucky charms are probably the most widely spread example of popular magic. Even today, many people have them in the form of items of jewellery, trinkets or ornaments. They might be things that are commonly held to be symbols of protection or good fortune, or they might be something personal for the individual, like a favourite mug or a cuddly toy given by a loved one. The newly refurbished World Gallery at the Horniman Museum in south London has a whole new display of English magical charms and amulets. They are mostly from the 19th and 20th century and were collected by folklorists including Edward Lovett. 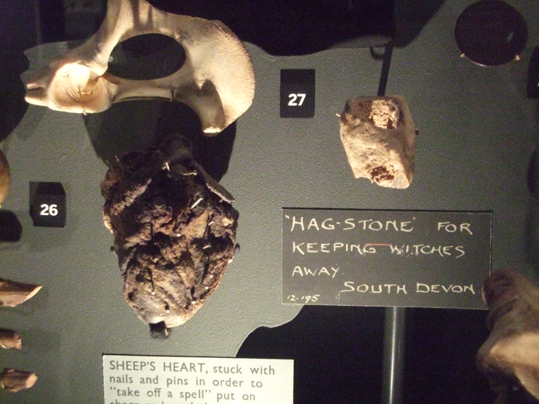 The photos here show some of the items in the display. I took the picture at Wonderful World Late. 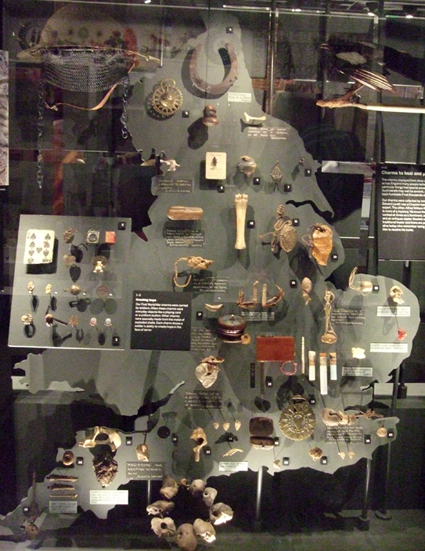 One case shows a map of England indicating where each charm was found and a bit about its history. You can see a close-up of a couple of items in the picture at the top. I'm guessing that today few of us - even witches - would choose to stick pins in a sheep's heart to "take off" a spell, but many might still consider holey stones - or hag stones - to be lucky. Personally, I've got quite a collection of them. I've even blogged about a spell to keep the holiday spirit, which involves finding a pebble on a beach - ideally one with a hole in it. Another part of the magical charms display shows modern photos of people wearing jewellery they believe is lucky or protective. One image shows someone wearing a pentacle, which is a symbol with many different meanings. For pagans, it is protective and also represents the elements of earth, air, fire, water and spirit. Some see it as a symbol of Venus, while for Christians it represents the five wounds of Christ. foreseeable future. I want to encourage you to continue your great work, have a nice holiday weekend!